Jill Krutick celebrates her the seventh and final Reflections lookbook featuring her Swirl Series. Enjoy a selection of paintings ranging from Krutick’s earliest to most current works done in her signature swirl style, as well as a short essay and excerpt from Bruce Helander. Helander is the curator of Krutick’s solo show, Lyrical Abstraction, at the Coral Springs Museum of Art in Coral Springs, Florida. Designed by Simone Kurtz. Available in print, desktop, and mobile formats. Printed in 2019. Click here for mobile view. Enjoy our sixth Reflections installment: The Aurora Borealis Series. This celestial lookbook features the highlights of Krutick’s magical style, including a short essay describing the inspiration behind the paintings. Designed by Simone Kurtz. Available in print, desktop, and mobile formats. Printed in 2019. Enjoy our fifth Reflections installment: The Shangri La Series. This brochure showcases this series’ expressive range—from bubbling, springtime energy, to calm, peaceful atmospheres—in 10 beautiful featured pieces. A short essay is included with a special comment from art historian, Annette Blaugrund, Ph.D. Designed by Simone Kurtz. Available in print, desktop, and mobile formats. Printed in 2019. The fourth of the Reflections publication series, The Dreamscape Series showcases over nine dreamy, ethereal paintings from the title style, in addition to a short essay with an except from art critic Donald Kuspit. Designed by Simone Kurtz. Available in print, desktop, and mobile formats. Printed in 2018. Page through the third Reflections installation: The Ice Cube Series. Discover the “fire from within” through the spectrum of styles within this series, including a small essay with excerpts from art critics Donald Kuspit and Annette Blaugrund, and over twenty selected paintings. Designed by Simone Kurtz. Available in print, desktop, and mobile formats. Printed in 2018. C O L O R A M A, held in October 2018 in the National Arts Club in New York City, through pages of painting descriptions, critical essays, and original sketches of hanging elevations. Booklet by Dan Ellis. Printed in 2018. Explore the Abstract Landscape Series in a beautiful trifold brochure for both desktop and mobile. 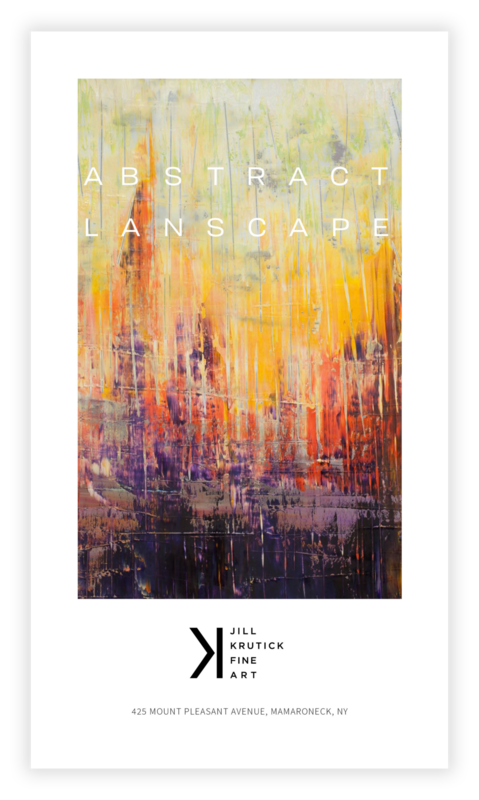 Inside includes a descriptive snapshot, an excerpt from art critic, Donald Kuspit, and images of 11 selected abstract landscape paintings, all of which are available (except for the cover image). Designed by Simone Kurtz. Available in print, desktop, and mobile formats. Printed in 2018. Note: Please refresh the page on your browser if the PDF does not load correctly. This trifold guide provides a taste of the creative process behind Jill Krutick's Geometric Series. It includes eight highlighted paintings and a description by Jill Krutick explaining her process and inspiration for this series as well as an excerpt from art historian Annette Blaugrund. This is the first of seven brochures that will cover each of Krutick's painting styles. Designed by Simone Kurtz. Available in print, desktop, and mobile formats. Printed in 2018. Jill Krutick celebrates her studio/gallery's first year of opening with a collection of work that features 17 new paintings done over the first six months of 2018 in a beautiful trifold catalog. Includes a short essay by Krutick and several highlighted critical acclaims by Donald Kuspit, Anthony Haden-Guest, and Annette Blaugrund. Designed by Simone Kurtz. Available in print, desktop, and mobile formats. Printed in 2018. With an introduction by Ira Goldberg and essays by Annette Blaugrund and Bruce Helander, this 32 page book showcases the paintings of Jill Krutick with 27 full color representations of some of her favorite artworks. Printed in 2018. Published on the occasion of the grand opening of Jill Krutick Fine Art in Mamaroneck, New York, March 2018, this trifold catalog includes an essay by Bruce Helander and a well-curated selection of Jill's work. Printed in 2018.